I came across the Best Kept Secret label quite by accident. This Italy-based label, distributed the last CD by Garfields Birthday. I figured that if they had a group as great as Garfields Birthday on their label that chances are they had more great, obscure pop bands! These are the first four cassettes that I've recieved from Best Kept Secret, so I've decided to use this opportunity to start reviewing cassettes as well as CD's. John T. Baker - "Little Rock Songs"
John T. Baker performed and produced this one-man show solo cassette from 1997. He currently plays in the band, the French Broads (reviewed in the CD section this month). Ironically, I find this tape more accessible and appealing than the current French Broads release. The songs are just more memorable. I find myself humming these songs during the day, especially the fantastic first side. Caligari - "The Full Moon Postcard"
This just ain't my cup 'o tea. I'm a power pop junkie...maybe that's why I just didn't get the grunge thing. These guys would probably do great on an "alternative rock" station, but their songs (at least on this tape) don't appeal to me at all. The all seem slow, dirge-like creations that are a cross between old REM and the Doors. 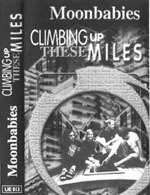 In the immortal words of Mr. Big (from the movie "That Thing You Do"), "I want something snappy...something peppy...but none of this 'lovers lament' crap..."
Moonbabies - "Climbing Up These Miles"
This is proof that psychedelic rock is not only NOT dead, but can be translated effectively to present day music. The moody, "trippy" textures of this album makes it a perfect car-cassette (it didn't leave my car cassette deck for at least a month!). But, the 24 tracks on this tape date from various sessions between 1997-1999. They are fresh, without sounding retro. There ain't a dog in the bunch! My only complaint is that they don't annunciate well, so the lyrics are sometimes hard to decipher. This tape will definetely make you search out more from this Swedish rock band. Twelfth House - "Twelfth House"
This harmony-laden trio is competent and the band has great chops...but, the songs just aren't great. "Passive" is the only song on this 6-song tape that shows promise of what this band can possibly achieve. It will be interesting to see what they can do with a follow up release (with hopefully more songs! ).